A scene of violence recorded in a community in Rivers state. No election is absolutely perfect but does this explain why 16 Nigerians died during the polling process. 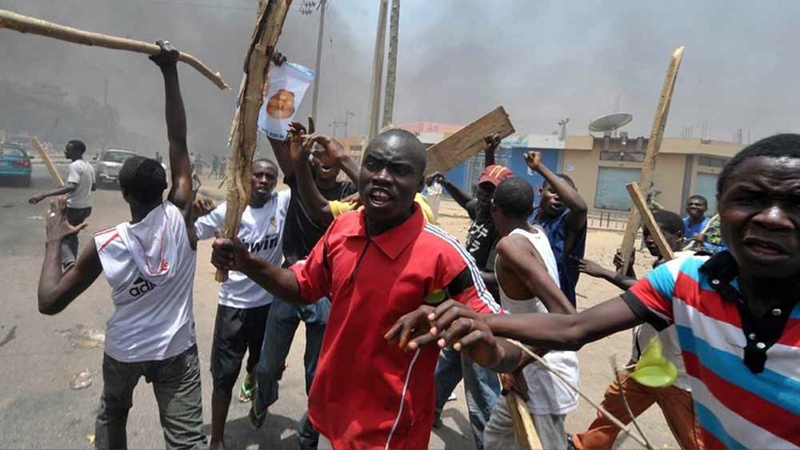 The Nigeria Civil Society Situation Room has claimed that at least sixteen (16) people were killed in election violence across the country on election day. Clement Nwankwo, convener of the group, revealed this at a Press briefing in Abuja on Saturday. Nwankwo said election violence was still seen in the country, despite promises made by the Independent National Electoral Commission (INEC). “We note with concern the rising incidences of violence and reported deaths in some states of the country. At the time of this statement, Situation Room has received reports of about 16 deaths across eight states: Borno – 2, Bayelsa – 2, Rivers – 6, Yobe – 2, Kogi -2, Ebonyi – 2, Lagos – 1, and Zamfara ,” he said. Nwankwo also flayed INEC for the delayed voting in some parts of the country. “The late arrival of materials and ad-hoc staff account for much of the delay in polls opening across the country. In some places, voting started around 11 am. The delay in the commencement of vote will certainly affect the collation process, which is now feared to extend well into the night, with attendant security risks and further logistics concerns,” he said. YIAGA Africa (Youth Initiative for Advocacy, Growth and Advancement), a group that is one of the members of the Situation Room said the South-East and South-South recorded the lowest number of early poll openings. According to the group, about 27 percent of polling units had opened as at 10 am in the South East. In the South South, it was only 21 percent. The average across other parts of the country was about 45 percent as at 10 am. INEC disagrees with these figures scoring itself a national average of about 71 percent as at 10 am. The organisation also condemned vote buying which was seen and reported in Lagos, Niger, Edo, Kwara, Kano and Katsina States, Ogun States.